Anders Thomsen crashed out of a European Championship event. 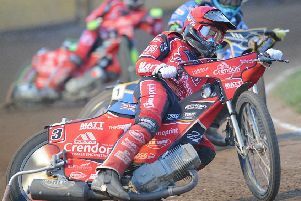 Peterborough Panthers rider Anders Thomsen’s first Speedway Euro Championship (SEC) campaign came to a painful conclusion last night (September 17). The Danish ace suffered a broken left arm, a foot injury and mild concussion in a frightening smash in the final round at Rybnik, in Poland. Thomsen clipped the machine of rival Vaclav Milik in his opening race and the impact sent both men crashing to the deck. While Czech rider Milik walked away unscathed and went on to finish second on the night, Thomsen immediately looked in huge discomfort and sprinted back to the pits clutching his injured arm. He was taken to hospital in Rybnik and was due to be kept in overnight before learning whether or not surgery is required. Thomsen, who finished 14th in the final SEC standings, will almost certainly be ruled out of Panthers’ final meeting of the Premier League season away at Edinburgh, should they succeed in scheduling it.